Village NW 13th Annual Benefit Run, Walk & Roll (2018) - AllSportCentral.com - Registration. Results. Relax. Village Northwest Unlimited will be hosting the 13th annual benefit Run, Walk & Roll event. Races will include a 5K run, 10K run and a 1 mile walk/roll. The 1 mile walk will be wheelchair accessible enabling those who are unable to walk to "roll" their wheelchair. Pre-registration is strongly encouraged before May 18, 2018 to guarantee a shirt before the race. Packet Pick-Up for 5K & 10K races: Packets with bibs, t-shirts, chips and maps should be picked up in the Wansink Center on the grounds of Village Northwest from 4:00pm to 5:30pm on Friday, June 1. Please make every attempt to get your packet on Friday because there will be limited time available for packet pick-up on Saturday morning. Packet pickup on Saturday will be from 6:45am to 7:30am. Those doing the 1 mile walk/roll will not need to do packet pick-up on Friday or Saturday, but should check in and pick up their t-shirt on Saturday morning prior to 7:30am. All events will start at 8:00 am on the grounds of Village Northwest Unlimited. Village Northwest is located 1 1/2 blocks north of Highway 18 and 18th Avenue. All events will be run on a well marked, hard surfaced, flat to gently rolling course, utilizing the Sheldon Recreational Trails, the Village drive, and Sheldon city streets. Traffic will be controlled and aide stations will be located on the course. Overall male and female winners in the 5K and 10K run will receive a trophy. 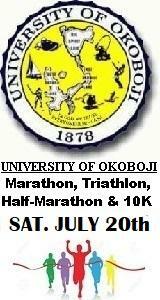 Top 3 male and top 3 female finishers in each age group will receive a medal. Collecting sponsorship pledges for this event are optional. As a Run, Walk & Roll participant, you can increase the impact of your effort by encouraging others to sponsor you in your participation. Money raised will be used to improve services and quality of life for individuals with disabilities that are served at Village Northwest Unlimited. Pledge materials can be sent to you upon receipt of registration or by calling Samantha at 712-324-5416. All events will start at 8:00 am on the grounds of Village Northwest Unlimited.